I am glad to be participating in a blog hop, 6-Word Memoir, initiated by Blogplicity, one of my favourite blogging groups on Facebook. In this tag, one writes one's memoir in 6 words. Can you imagine just 6 words! This tag was passed to me by Martha J. M. Orlando, whose blog Meditations of my Heart has always enabled me to reflect and ponder about many things in my everyday life. 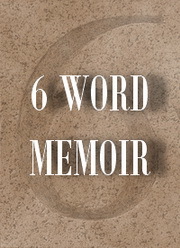 You can find her 6-word Memoir here in her alternate blog titled Moments and Musings. I now pass the tag to Privy Trifles who blogs at Memoirs of Me. Privy Trifles is a sensitive blogger who has a kind and tender soul. Aren't we all?! Loved it! And I love the positivity, that you progress everyday. Many of us take on step forward and three steps back. Even if progressing slowly, one tiny step forward at a time, is better than one giant step backwards. Positivity is something that I consciously include in my daily diet, otherwise I would be completely lost. I love those six words Susan :) I love the infinite possibilities that we all have...it's always something I look forward to each day. Lots of love! Lots of love back to you, dear Melissa. The infinite possibilities are definitely many. Perfect, I'm only sorry I won't be able to use them on my day! Welcome to the Meanderings, Cairn. Looking forward to your 6 words. Smiles back at ya, Brian. Six powerful words indeed. All of us has things to improve on. Yet, we can love the same (smile). Thanks for the visit also. Andy, how nice to see you here. Love and Andy have to be synonyms, always. Oh yes, we are, Janu. Confusions are part of progressing, Rajesh. Don't you think so? Nice - life would be pretty boring if we weren't WiP. Absolutely Suzy. In varied degrees, we progress everyday. So like you Susan! Lovely! i really love those 6 words, dear susan. growth is an ongoing part of life. you'll never wake up one morning and realize that you're perfect. Exactly and I'm not the same person I was last week. Hope you're having a fantabulous Sunday, dear Betty. Love those six words--so many possibilities! Perfect Muthiah. Thanks for stopping by and commenting. Wow. Six words. That's quite a challenge. But you conquered it beautifully Susan. I love how you see yourself. Myrna, many thanks for your always warm words. Yes. Some realise and some don't. Marvelous, Susan! And, thanks so much for the references to my blogs. You are so kind and thoughtful! My pleasure, Martha. Your blogs should be read by many for inspiration and joy. Absolutely. We are all a WIP. You should also attempt one like this, Rahul. A six word memoir? "Life is short; no time to...."
Ah, we do have lot of time if we make time, Galen. Zuzana, thanks. Hope you are doing well. For some reason, I want to say, "Rock bottom was the foundation on which I built my life..."
And you also said that. I also read that. Love you memoir, Susan. Those are words for us all to live by! Absolutely Adriene. Thanks for stopping by. Lots of love and cheer. Perfect! What's life if we don't improve everyday! Cheers! Absolutely, dear Deepa. Life gets better by the day, no matter what.